At some point everyone has a problem with Linux that they can’t solve alone, but these things never stay a problem for long, do they? 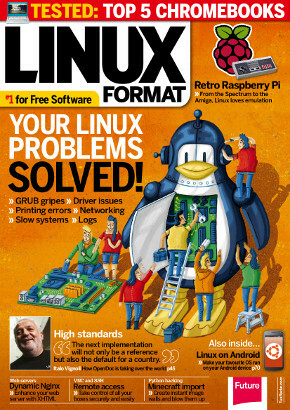 To boost your innate troubleshooting knowledge and draw together a useful collection of tried and tested fixes, we’ve collected together a huge 14-page collection of the most common Linux problems. For a trouble-free experience we’ve done a Roundup of the best Chromebooks on the market. Plus there’s our usual great mix of FOSS delights, from the next-gen Nginx web server to post-quantum encryption techniques. We cover running Linux on Android devices, old-school emulators and Open Office macros, more Minecraft hacking and how Facebook is making PHP a little friendlier with Hack. On the DVD: Tails Linux 1.1, Deepin 2014, Ultimate Boot CD, System Rescue CD and Rescatux.